The last month has just flown by! We had a great Christmas spent with family and rang in the New Year with friends. Then a few days later we left behind cold Minnesota and jetted off to Disney World with my parents and my sister and her family! The weather was gorgeous - in the upper 70s and low 80s (on our last morning I got a text that our son's school was cancelled due to icy conditions! Made it hard to leave!) The whole trip was to celebrate my parent's retirement (when we got back my dad had two more days left and my mom retired back in April). We had a most magical week! Disney is truly a happy place for me and it was special being there with my wonderful family. And to make it extra special, it was my niece's first trip! She loved the characters and she was quite the character herself! Uffda! There's a Viking chasing you! The Festival of the Lion King - My favorite show... makes me cry every time! Love going at a slow time - 9:30am and plenty of room to run in Fantasyland! Happy Anniversary, Mom and Dad! Thank you for an amazing trip! Hope you find something to do on Wednesday! ;) Love you two so much. 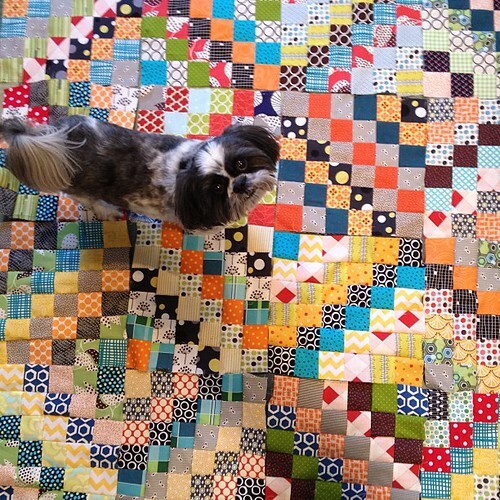 Before we headed off to Florida I squeezed in some quilting... I got sucked in to the Scrappy Tripalong as I saw blocks popping up on Instagram. I asked my son what he thought of it and he liked it so this is destined for his bed. So far I have 16 blocks done and they are a blast to put together! Just need enough to make it a twin size. Here's a link to the pattern - it's a fun one to do! I'm also participating in my first virtual quilting bee, Stitch that Stash, with a wonderful group of women. Thank you to Kris at Duke Says Sew What for extending the invitation! First up is a churn dash... I got the first one started tonight. Look forward to posting pictures soon! Have to get them done soon since in a little over a week I head out to California for a work conference. This year is off to a great start - a week in Florida and then a week in California all in the same month?! Makes a chilly Minnesota January much more tolerable! I feel like I just went to Disney World! Great pics! Your trip along looks great. Have u seen the plus block is the next one up? I'm making one tonight.